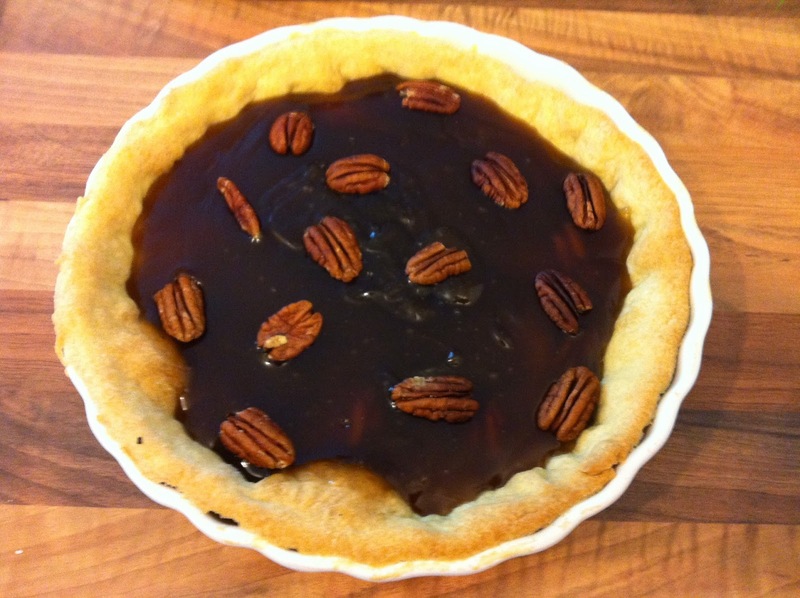 Pierate - Pie Reviews: Reci-pie Review: Oh My Pecan Pie! One of the great things about being a pie addict is that you sometimes get given pie-related presents. For Christmas this year one of my friends wrapped up a massive tin of proper Canadian maple syrup for me, which came complete with a recipe for maple pecan pie on the top! As delicious as the recipe looked, there was a big problem with it – it didn’t have a lid. As regular readers of pierate.co.uk will know, a pie with a lid is, in fact, not a pie at all, so I had to modify the recipe a bit. However as this is probably the sweetest, gooiest pie I’ve ever eaten I was glad of some extra pasty to add a bit of crunch. 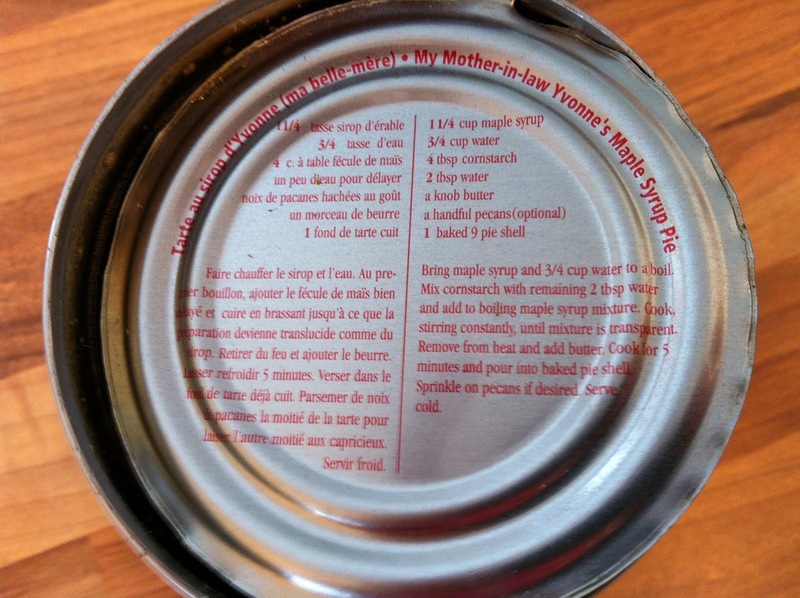 I’m not sure how well you can see the recipe in the photo, but it calls for a nine inch pie crust, so the first thing you’ll need to do is make a batch of shortcrust pastry, roll it out and cook it in a pie dish. If you’re a pie purist like me, make sure you also bake a lid (I went for a lattice top). You cook the filling for this pie separately rather than in the pastry, so you’ll need to add your lid on at the end. Pour 1 ¼ cups of maple syrup and ¾ cup of water into a pan and bring the mixture to the boil. Then mix 4 tbsp cornflour and 2 tbsp water together and add it to the boiling syrupy mixture. Keep mixing and eventually the mixture will turn dark brown, thick and shiny. One the mixture has thickened up, take it off the heat and stir in a knob of butter. Then leave it to cool for about five minutes before pouring the syrup mixture and a large handful of pecans into the pie crust. Finally, once the mixture has cooled a little bit, add your lattice lid to make it a proper pie. The colour of this pie is down to you, so be brave and leave the pastry case and lid in the oven until they’re a nice golden brown. You also need to keep cooking the maple syrup and cornflour mixture until it turns a really dark, shiny brown. Do both of these things and this pie will score top marks for colour. This pie has the most ridiculously wobbly, gooey, sweet, sugary consistency of any pie I have ever eaten, with lovey chewy, crunchy pecans. I absolutely loved it and couldn’t stop scoffing it with vanilla ice cream and cups of tea – but if you don’t like sickly gooey things then this definitely isn’t for you. The original recipe lost some points when it came to capacity because it didn’t have a lid – however once I’d rectified that small problem I found that there was a perfect crust:filling ratio. You definitely need the extra pastry on top of this pie to cut through the aforementioned gooiness. 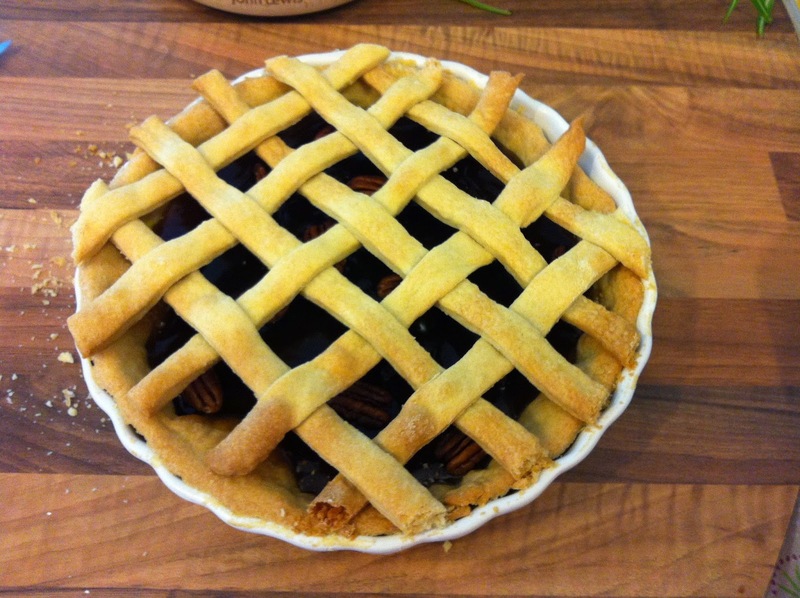 Apart from the pecans, there isn’t much chewiness going on in this pie. Just yummy, gooey, sugary goodness. Mmmmm. 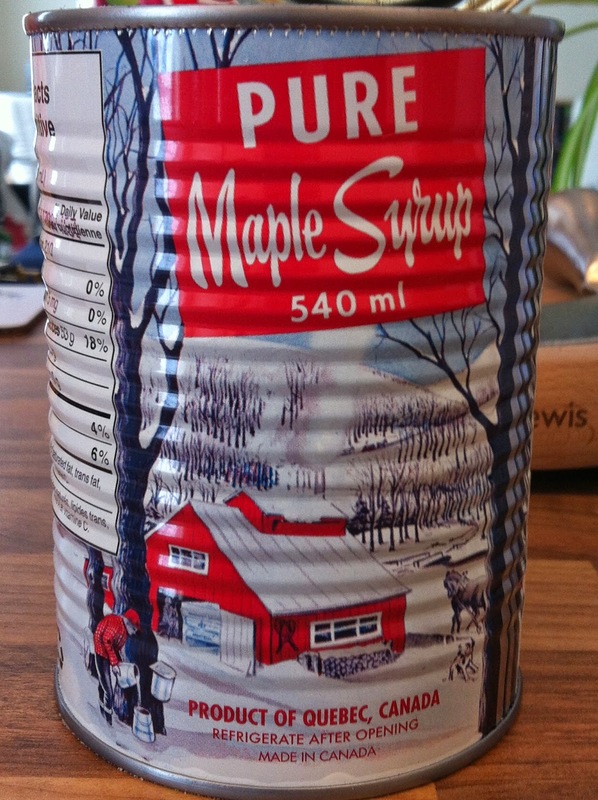 Proper maple syrup (rather than the maple-flavoured but not-actually-maple syrup you can also get) isn’t the cheapest ingredient you’re going to find in your cupboard, but it’s not too bad considering you can use the leftovers in all manner of delicious baked goods. Even better, the rest of the ingredients in this recipe are really cheap and this pie looks, smells and tastes amazing, so it’s definitely worth the cost of the syrup. Pecan pie is a bit of a novelty in the UK, as we tend to think of it as being a Canadian/American classic, so I think this wins points for having an interesting flavour. The texture of this pie is also very different to anything I’ve ever eaten – a bit like a treacle tart only without the breadcrumbs. I’m trying not to use the word gooey again but there’s really no other way to describe it. As long as you cook the filling for long enough, this pie will have golden pastry and a shiny, set-but-still-soft filling, giving it a very high score for condition. It also smells amazing and you’ll struggle to get your nose out of it for long enough to actually eat some.